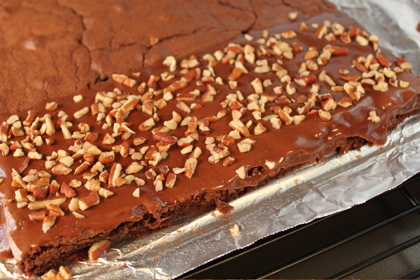 My Classic Brownie Recipe is so easy, you may never make brownies from a box again! Ten easy ingredients, no mixer required, and no need for special chocolate — unsweetened cocoa powder is all you need! 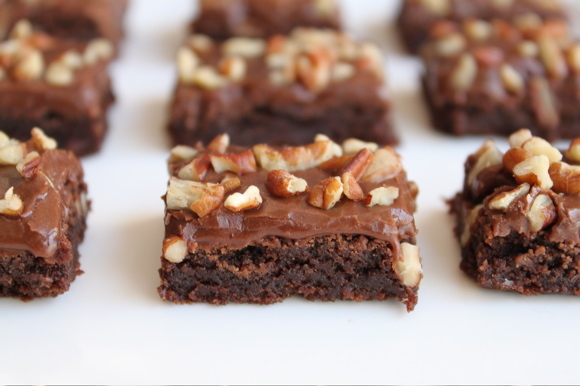 Watch the How to Make Brownies Video. Is it frosting or icing? Many say it depends on when the topping is applied. 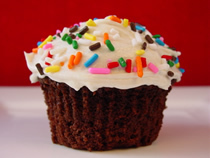 Whatever your preference, you can use the same recipe for a fluffy frosting or a delicate icing. Sweet. NOTES: Makes a 9″x9″ pan of brownies. For best results, eggs should be at room temperature. 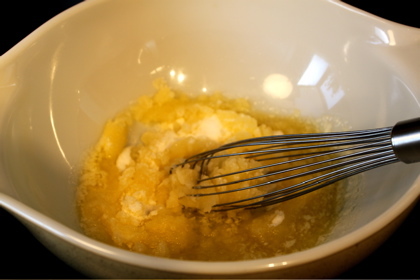 Add melted butter to sugar and mix thoroughly. 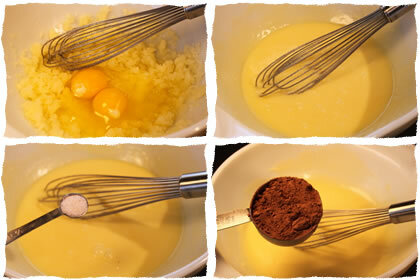 Add two eggs and mix until smooth. Then add baking powder, salt and cocoa powder. Mix thoroughly. Add flour to mixture and, again, combine thoroughly. Preheat oven to 350(F). 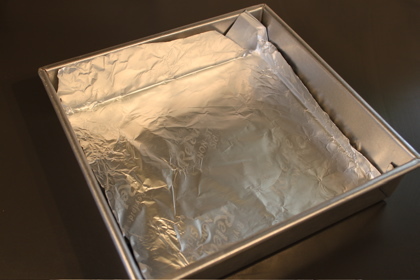 Prepare baking pan with non-stick foil or wax paper. Pour batter into pan and spread. Place baking pan and batter in the freezer for about ten minutes. Then, bake for 20-25 minutes at 350(F). See why I like this non-stick foil? It’s awesome! Make the frosting (or icing… whatever you want to call it). 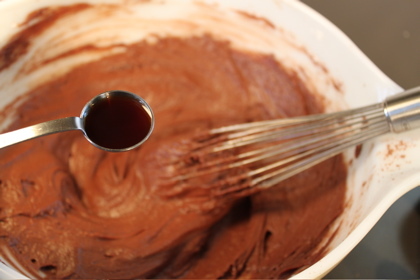 Melt butter and stir in cocoa powder until smooth. Stir in two tablespoons milk or cream. 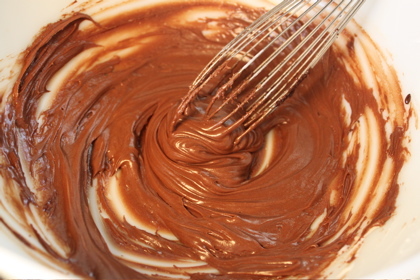 Mixture should be creamy-smooth. 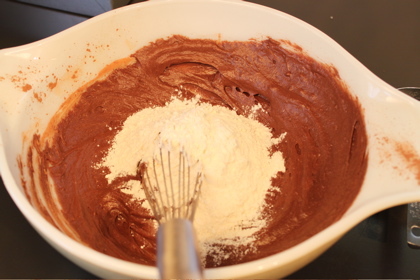 Run whisk through powdered sugar to remove any large clumps or lumps. 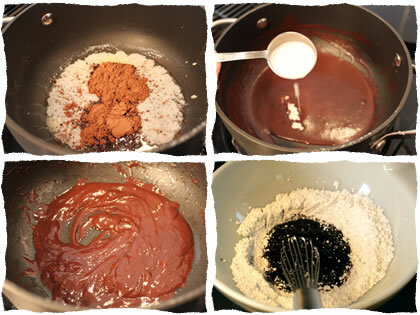 Add chocolate mixture to powdered sugar and mix well. 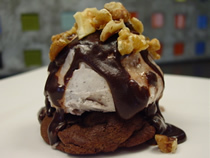 You don’t have to do this, but I carefully cut the edges to square off the brownie. 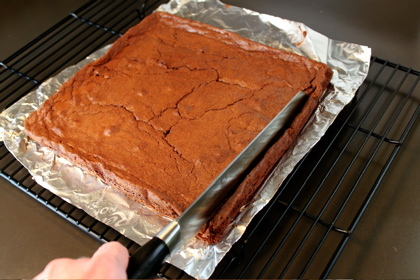 To prepare brownies with icing, spread the icing on the brownies while the brownies are still slightly warm. This will melt the topping, magically turning it into icing! 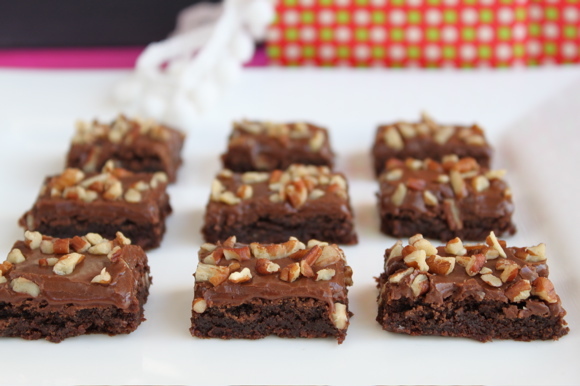 Before the icing sets up, sprinkle pecan pieces (or any chopped nut or candy) on top. 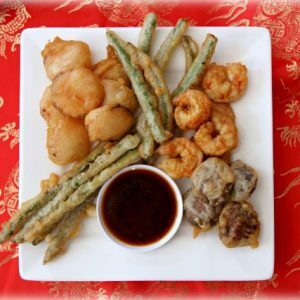 Allow to rest and cut into bite sized pieces. 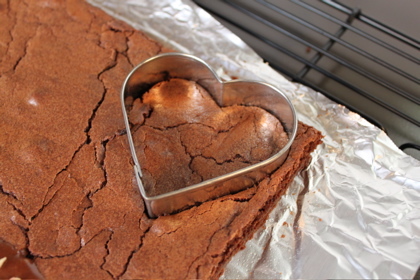 You can also use cookie cutters to cut the brownies into fun shapes. 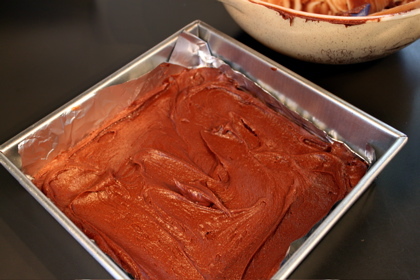 To prepare brownies with frosting, wait until the brownies have cooled to room temperature before frosting. 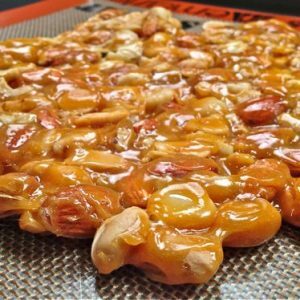 Sprinkle with nuts or candies, if desired. Oh brownies are a big downfall for me, I just can’t eat one or two or even three! I’ll skip the nuts and take double chocolate please. 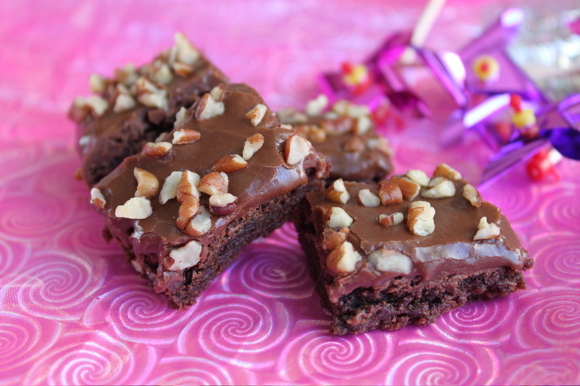 I am such a sucker for brownies too these are great for valentine’s day! 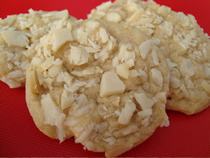 GREAT RECIPE, AND IT’S EASY TO FOLLOW AT HOME IN YOUR OWN KITCHEN. THANK YOU :) — THAT WAS A HUGE HELP FOR MY SCHOOL PROJECT! great recipe. My neaces are going to LOVE this. These brownies were good, but they were a lot more cakey and light then I expected from the pictures (which are stellar, by the way). I must have done something wrong with mine. Perhaps I make this recipe again? Any excuse to lick more brownie batter off the sides of bowls, haha. Hi Jess, Sorry to hear the brownies were more cakey than you would have liked… I might suggest going a little easier on the flour and trying to stir the batter just till combined. Also, since oven temperatures vary, try baking them for a shorter time. 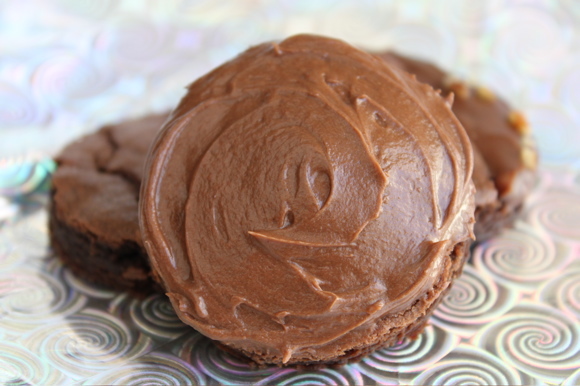 I hope you give it another go– and definitely try them with the icing :) Happy New Year!! I made a few substitutions but followed your recipe. They are soooooo delicious! Big hit! Why do you freeze the brownie batter before you bake it? Hi shine, It’s not a freeze, just a ten minute chill or rest :) Because I’m looking for these brownies to have fudgy consistency, I think the chill helps achieve more fudginess. Hope this helps! 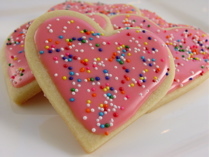 Happy Valentine’s Day!! Sounds like a great recipe…is the butter salted or unsalted? 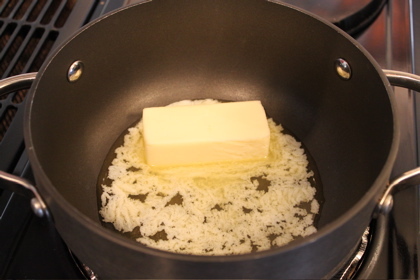 Hi jack, I use salted butter for everything :) unless noted. Hope you enjoy the brownies! 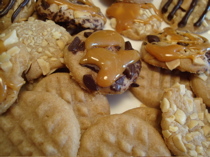 Thanks, making them tomorrow for a church event…. Brownies turned out great! The icing was great, not too sweet, not heavy, just right. 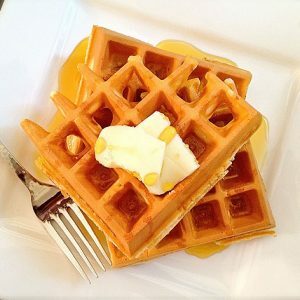 Great recipe and simple to boot. The event was a funeral, so that is what it is. But the brownies were great. Where do you get the cool square pans? Just an update. 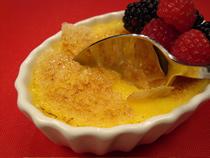 I have made this recipe several times using a rectangular pan and they always turn out great. Yesterday made them for the church youth using my new shiny aluminum 9 x 9 pan and they turned out much fudgier. They were fantastic. 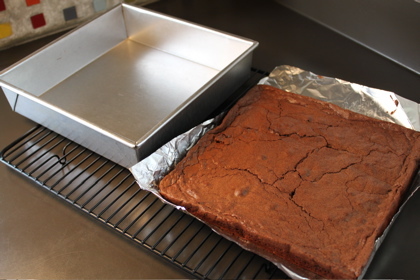 I was concerned because the batter barely filled the bottom of the pan, but they rose to typical brownie height. Hi Holly! I’m so happy to hear it :) Thanks for dropping by to let me know! good stuff! i made brownies last night and it tasted awesome! 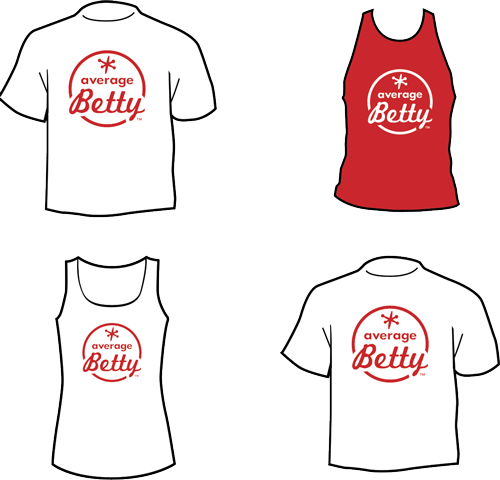 now i’m planning on making several batches of these to give away on christmas. thanks for the recipe!!! but have other small moulds so should i make it in them??????????????? Hi aishwarya, If you don’t have a 9×9 pan, try using an 8″ pie plate or cake pan to bake them in… They’ll be a little thicker but still delicious. 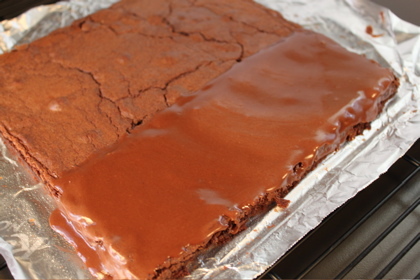 If you have a 9×13 pan, use aluminum foil to make a wall and bake the brownies that way. Hope this helps! Hi aishwarya, Use the search tab at the top right of the website and you’ll find tomato soup and a red sauce pasta recipe. For the tomato soup, use vegetable stock instead of chicken and simply omit the meat from the meat sauce. Hope this helps! 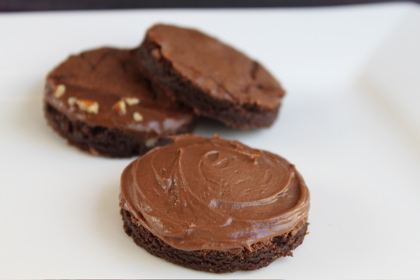 This post was mentioned on Twitter by averagebetty: Make Brownies w/ your kids! http://bit.ly/d0ss9m –>>RT @ricksanchezcnn: kids just learned no school tomorrow. snow day!!!!!!!! !